E-mail is the communication tool in today’s business world. Surveys show, however, that often times, e-mails cause confusion and tension with lasting negative effects instead of promoting successful business relations. Here are strategies that help you avoid this from happening and make sure that your e-mails get the results you want. In part one and two of our guide on effective e-mail management we discussed strategies that help you organize and customize your personal e-mail account. Additionally to bringing order to the chaos in your inbox, writing effective e-mails is another aspect of the overall effective e-mail management. 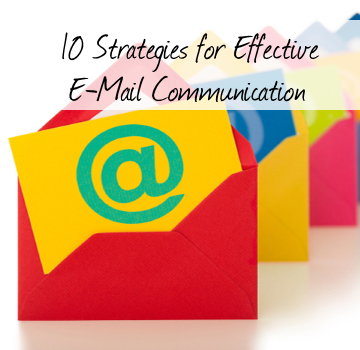 Follow these simple strategies for clear, effective and successful e-mail communication. On average, an office worker receives about 80 e-mails each day. With that volume, it is not surprising that individual messages do get overlooked sometimes. If you want to reduce the number of e-mails you receive, start with yourself and write less e-mails. Before you start writing an e-mail, ask yourself “Is this really necessary?” Or could you simply pick up the phone and get the information you need in one short call? This one call may very well spare you longwinded back and forth discussions, saving you and your communication partner valuable time. Every headline has two functions. Number one: Grab your attention. Number two: Give you a good idea on what the article below is about so you can decide whether or not your want to read it. Consider the subject line your e-mail headline and make sure that it delivers the most important information. This also means, don’t send e-mails without a subject line. At best, an e-mail that lacks a subject line gets overlooked and you have to write a follow-up message that helps you get the attention you wanted to achieve for message number one (the vicious cycle of over-communication – see above). In the worst case, it will appear like spam to the recipient and the message including the sender contact might end in the spam folder. On a different note, the subject line is a valuable indicator when searching for e-mails in your inbox or sent items connected to a specific topic at a later point. If you do decide that the communication you are about to start is best conducted via e-mail, be precise. Business e-mails replace the traditional business letter as just as the former letter, the content of your e-mail should be clear and concise. Keep your phases short and get straight to the point. This not only shows that you know exactly what you are talking about but implies that you value your communication partner’s time. I mentioned above that you should avoid over-communication. This does not mean that you need to cram as much as possible into one message – especially if the content that is combined in one e-mail has no connection. For easy reading and understanding of one message, make sure that you only cover one topic per message. Unlike the traditional business letter, composing and sending several e-mails doesn’t cost much more effort than one single message. This not only helps you be more precise in your e-mail but it also makes it easier for the recipient to keep the response brief and precise. Do you receive e-mails that are not relevant to the projects you work on? After diligently reading through them you move them to the archive. It’s annoying, right? Therefore, check the recipient list before sending your e-mail and make sure that it only includes people that really benefit from the information provided in the message. It is little effort for you and a great time saver for the recipient – that pays. If you apply to this rule, colleagues and partners who receive your e-mail are sure that your messages are important to them and will pay the attention they require. If possible, try to use hyperlinks to the file path of message related documents. Especially when communicating within your organization, using hyperlinks instead of attaching the document itself ensures that the recipient gets the latest version of the file. Additionally, if the recipient of the message has to edit the document, he/she can immediately save it in the same location. To add a hyperlink to your message, go to the Insert Tab on the Message Ribbon and click on Hyperlink. 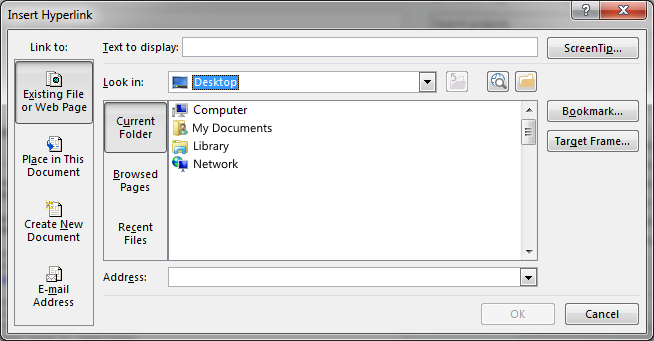 A dialogue box will open and you can choose the file path from the drop down menu, add the linked text that will be displayed in the message or add a URL in the address box. After filling in all the information, click OK and the hyperlink is included in your message. Question on task XY that is part of Project Z? You can put your response to the question above right below and to separate your response from the original question, you can choose a different color from black, like dark blue. Make sure that the color you choose is still easily to read against a white background and looks professional. You may even put the message/question you refer to in bold or italic for further clarification. E-mail is a widely used communication tool in every single part of our life. People often think that traditional standards of business correspondence doesn't apply to e-mails; after all, it is a modern mainstream communication tool. This is not the case. Standards for written business correspondence in terms of politeness, form, etc. also apply to business e-mails. Make sure to include an address and a correct one too as well as closing your message with “Regards,” “Yours Sincerely,” etc. as appropriate. Don’t forget to add your e-mail signature at the bottom of the e-mail that includes your full name, e-mail and direct phone line. Avoid slang and informal language in the message body unless you are writing a colleague or partner you are on very good terms with. Don’t add emoticons if you don’t know the recipient very well. Always keep in mind: The messages you send are a reflection of your own professionalism. In vis-à-vis conversations, we use our communication partner’s body language, facial expressions and vocal tone to help us interpret what is implied in their verbal message. When communicating via e-mail (just as with traditional letters) all these supporting aspects of communication are lacking. This makes your choice of words and how you phrase your message all the more important. Re-read your e-mail before sending it and assess whether the content could be emotionally misunderstood. That said, sometimes we do get frustrated about something at work, rule number one for avoiding a rude tone in your e-mail message is not writing e-mails when you are frustrated. Highlight the message for follow-up and reply to it later. Before you hit the send button, take the time to check the spelling, grammar and punctuation of your message. An e-mail that includes typos and grammatical errors may indicate to the recipient that the author of the message didn’t consider the message important enough to pay close enough attention to its content. Consider the message body of your e-mail the business outfit you wear – you wouldn’t want to be dressed unprofessionally for a business meeting. You can also use the proofreading routine to check the length of your e-mail and erase unnecessary paragraphs. Outlooks help you not forget to proofread with its automatic spelling and grammar check. 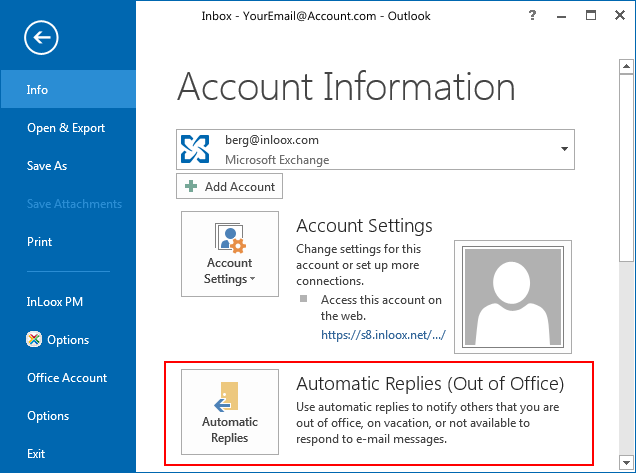 To activate the proofread feature open the Microsoft Outlook Options on the File Tab and click on Mail. Under Compose Message check the box “Always check spelling before sending” and click OK. From now on, every time you hit send, Outlook will run its spell check before actually mailing the message. Everybody deserves time off as a reward for their hard work. Or maybe you are on a business trip and have only limited access to your e-mails. In both cases, chances are that you might not be reacting to the message that you will be receiving despite your absence. It is only good business etiquette to let people know you are currently out of office and when you will return so they can plan their correspondence and follow-up accordingly. Moreover, you ensure that those reaching out to you know that a late response doesn’t mean disinterest on your part. 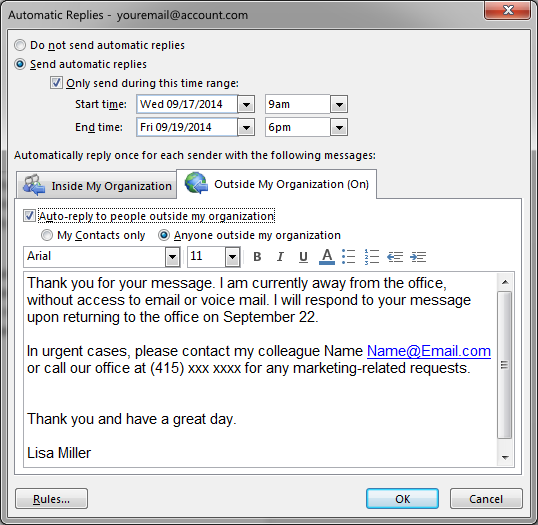 You can easily set auto replies like this: Click on the File Tab on the Outlook Ribbon and select Automatic Replies from the Info Tab. A dialogue box will open and you can enter a personalized message as well as define a time span during which incoming messages are replied to with the automatic message you just created. Strategies for Effective E-Mail Management Part 3 - InLoox • Copyright 1999-2019 © InLoox, Inc. All rights reserved.